And it’s like Christmas came early this year at Disney’s Hollywood Studios, because Starring Rolls Cafe has taken the perfection of the Red Velvet Cupcake and made it just a little bit better. 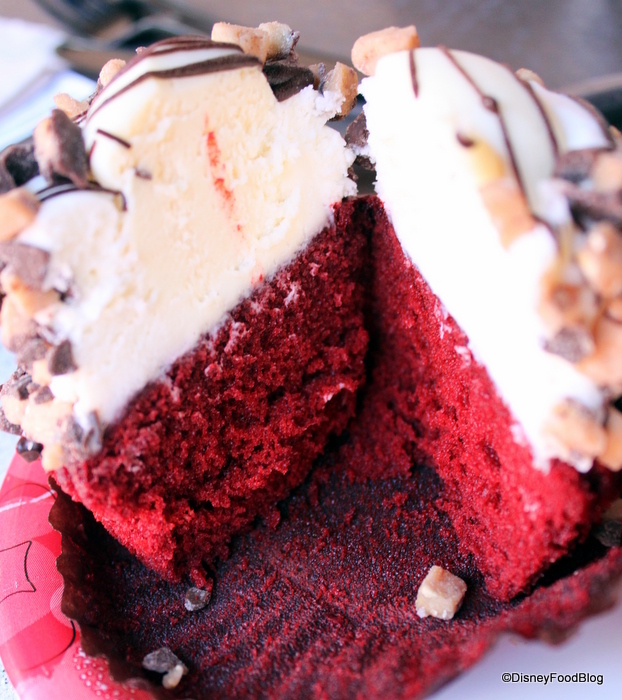 The Red Velvet Cheesecake Cupcake. That’s right. They’ve added cheesecake to the mix, and it’s pretty outstanding. 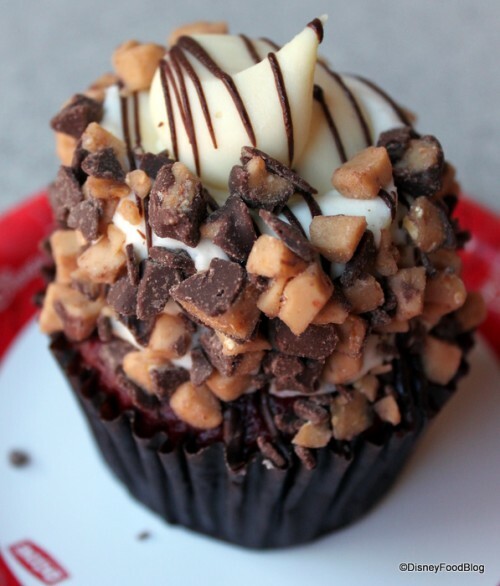 I first heard about this cupcake from Ryan at Main Street Gazette and I happened to be in Orlando at the time. You can bet I high-tailed it over to Hollywood Studios first chance I got! You’ll see from looking at the cupcake that the red velvet base is covered with piles of frosting. In the middle of all the frosting, you’ll find a little dollop of cheesecake. The whole thing is drizzled with chocolate and covered in toffee pieces. 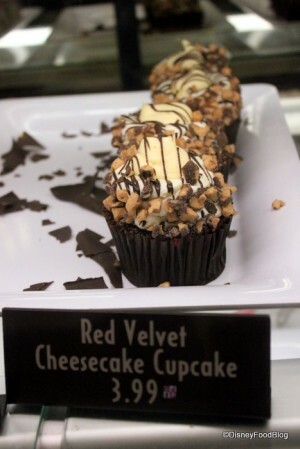 And it’s that little dollop of cheesecake — at least that’s what I tasted — that makes the cupcake a completely different experience than other red velvets. The cold, creamy-firm texture and tangy taste are a great contrast with the sweetness of the cupcake and frosting. Sold at Starring Rolls, like many of our other favorite Disney cupcakes, the red velvet can be had for $3.99 or a Disney Dining Plan snack credit. Have you tried it, yet? Is it on your list for you next trip? Let me know what you think in the comments section below! 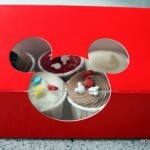 Review: Lemon Meringue Cupcake and MORE at Disney’s Hollywood Studios! That looks amazing. I’ve never had a cheesecake-cake type dessert before. Nor can I say I’ve had a red velvet with toffee bits on it before. It looks good, though. I wonder if it’s seasonal or if they’ll have it longer? Hmmm…wonder if a pumpkin cheesecake- cupcake is in the works?? Thank you Starring Rolls for another over-the-top cupcake creation!!! That looks amazing, I hope it’s still there in December! Rack up another victory for Starring Rolls, the Mecca of cupcakes at WDW! I just had this and it was absolutely amazing!!! I loved the toffee topping. My favorite cupcake so far! Carolyn — A Pumpkin cheesecake cupcake sounds divine!! Sara — Fingers crossed for you in December! Elisabeth — Thanks for the review! Looks really really really good! I’m going to have a challenging time deciding what to do with my snack credits! I have to agree with Matt. DHS seems to have some sort of cupcake nirvana going on. It makes me happy. I’ll definitely be trying this one. Could that possibly look any more delicious!!! Can’t WAIT to get there to try one of those! chris — They really do, eh? This one’s great, and I really liked the mini-cupcakes, too. Jill — Can’t wait to hear what you think of it! 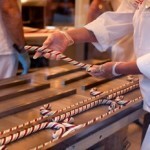 Beats the heck out of the carrot and celery sticks I was going to pack in my carry-on bag! Anna — Let me know how you like it! Michele — Looks great, eh? 🙂 Looking forward to seeing you at Reunion 2010! My Family and I shared this and several of the other scrumptious cupcakes at Starring Rolls on our vacation a little over a week ago and I have to say this was mine and my hisband’s favorite! We have already had a craving for it since returning home. We’ll be down starting this Fri. and i can’t wait to try this one!!! OMG. I need that NOW! Annie — Yay! I really liked it, too. 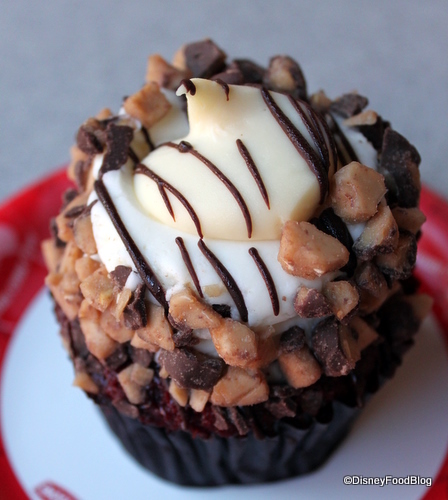 Still have to say, that Butterfinger cupcake is my favorite, but I think Red Velvet comes in second. Peggy — Can’t wait to hear about your trip! Amanda — When are you headed over to WDW?! Anytime soon? Lucky you can have DL anytime you want! Cupcakes just really are one of the best businesses this year! I’m guessing this pretty much tastes like the mini cupcake you had a while back, just with the cheesecake addition? I had one last week and it was heavenly! A must try. 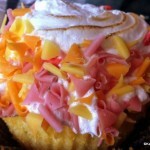 After reading this post, I planned on trying this cupcake on our January trip. I insisted that everyone in our group try it (I didn’t have to insist too hard, it looks pretty good) The general consensus of everyone in the group was, “Amazing!” We tried a variety of desserts and cupcakes while on our trip, and this beat everything else, hands down. Thanks for the tip DFB! I went into Starring Rolls looking for the butterfinger cupcake… but, after asking 2 people in house their fave, I ended up with this one.. I thought it was delicious, but my husband LOVED it. I still want to try other ones, but I think my husband will stick with this one! 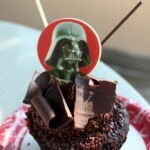 I had the honor of trying this cupcake this past February. It was wonderful! I can’t imagine eating an entire one myself, so I was lucky to be with 3 family members…we split this cupcake, and the carrot cake cookie for a snack. I can’t recommend this cupcake enough! I so wish they shipped their products! My question is, Could I get them in a to go box, and get them to deliver them to the park entrance or CSR for later pickup? Or would I have to carry them all day? Becca — My guess on the delivering to the front of the park is no — they can be weird about food and “shipping” of any kind — but it’s always worth asking!! This was the best breakfast I had the entire weeek I was at Disney World! yup- I said breakfast! We just got back from Disney a couple weeks ago and tried the Red Velvet Cheesecake Cupcake for the first time. I loved it so much that I went back a couple days later and got another one. I saw a program on Food Network awhile ago where the baker was putting already cooked cheesecake in a pastry bag and was filling strawberries with it. I think I will try making a red velvet cupcake, with buttercream frosting and will try his method of filling a pastry bag with the precooked cheesecake to add to the middle of the frosting. 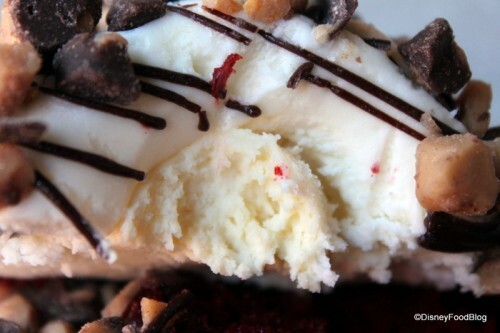 A crunched up Heath bar would make a good topping. (The cheesecake filling is baked without a crust, and he put it in a bowl and whipped it up a bit before putting it in a pastry bag.) Try it out and let me know what you think. So glad to find this blog! 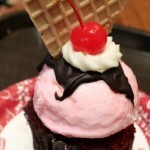 I did the same thing…made a mad dash for this cupcake this past visit, after discovering it 2 years ago. Love it! Wonder if anyone else at Disney makes the same cupcake outside of Hollywood studios. Dana — they have the same cupcake at Disney Quest, but that’s the only other place I’ve seen it. Had this when we were down a week ago. It’s wonderful and worth every calorie!! !